Magic. Here at the Orbit we like all kinds of things: art and music and food and history, but above all, the world-weary blogger is looking for magic. We found a neat little dose of it on a side street in Sheraden. 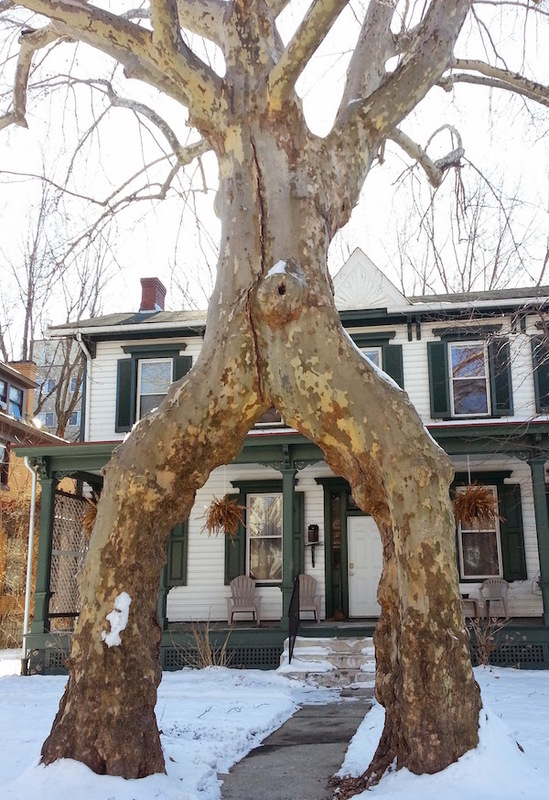 There, flanking the front walk to a very old frame house, are two great sycamore trees, trained up and over the walk to form a beautiful archway portico, and then ultimately grafted together into one united, very tall and healthy trunk that extends way beyond the top of the house. 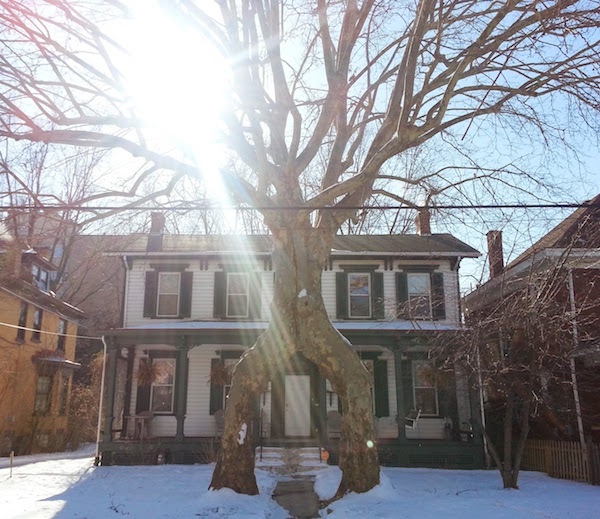 A 1999 Pittsburgh Post-Gazette story on the trees explains that they were grown by one William S. Bockstoce, a Sheraden banker and horticulturalist who lived with his wife in the home until their deaths in the 1960s. Bockstoce is also credited with cross-breeding tulips and roses that persisted on the property (at least up to the story’s writing–we may need to check back in the spring) and contributing to scholarly research on peonies. The then-current owners of the home estimated that the sycamores were started some time around 1940. I don’t know how long sycamores live, but here’s hoping this conjoined pair has another seventy-five years in them.